If you are looking for Paleo Food, I am in the same boat! It’s kinda hard to find Paleo recipes on the internet without paying for them. It’s not easy trying to create a Paleo meal when you don’t have recipes. The first of the year I started the Paleo diet. I am determined to have a paleo diet success story that will soon be written but first, I need Paleo recipes! I started with a Paleo Diet Food list before I attempted to make any desserts. 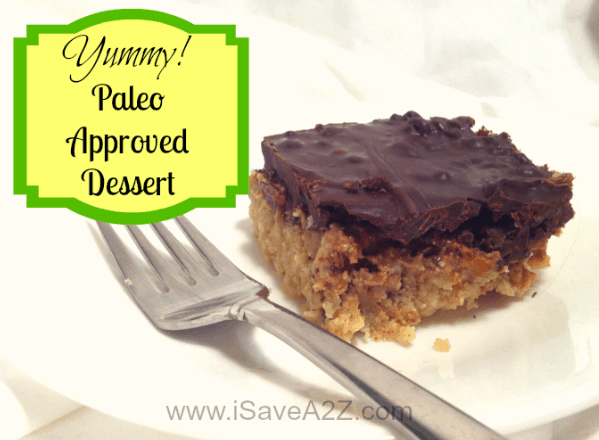 I was surprised at all the substitutions that I could use to make a Paleo Dessert recipe! Voila! I created Paleo bars!!!! But wait! Here’s the best part… the kids and hubby even liked it! Yay! Success! If you are starting the Paleo diet and need recipes, I plan to write many, many more! Be sure to bookmark the Paleo Recipes Category here. Here’s my attempt to make a substitution for a Peanut Butter bar recipe. I call it the Paleo approved Chocolate Almond Butter Bar! Mix together 1 1/2 cups Almond Flour with about 4 tablespoons of melted butter to create a crumb base for the bar. Press the mixture into the bottom of a small pan and set in the freezer. Take the crust out of the freezer and spread the almond butter mixture over the crust. Set it aside. By Jennifer on July 11, 2013 Desserts, Paleo Recipes, Recipes.